In Dean Holland’s final module of the online marketing class, Starting With Marketing Academy, I have learned how adding videos to your arsenal of traffic building tools builds a more personal relationship with your followers. There are two types of videos: Slide Deck and On Camera. On Camera videos consist of you speaking into the camera in a self interview or public speech style. Slide Deck videos usually involve PowerPoint slides with you speaking to the slides. My first video!–Slide deck with narration of how great this class has been! Starting with Marketing Academy Week Five Review: World Wide Winners! Dean Holland’s Starting With Marketing Academy has been a huge help in educating and energizing my effort to increase my online marketing business and the Week Five Module, “World Wide Winners” entails outreach to other websites to promote my blog. Early on in the class, Dean had us visiting each others blogs, partly to learn from and support each other, but also to form a new habit: visiting blogs to promote your own blog. Advice was given to not be too salesy/pushy or to directly promote anything. He covered a few things that can get you banned from certain websites and reminded us that the sig file (signature) in your blog post is where you can point others back to your blog. Starting with Marketing Academy Week Four Review: The Money is NOT in the List??? I have been taking Dean Holland’s class: Starting With Marketing, The Newbie Internet Marketing Academy and would like to share some thoughts on Week Four’s Module: List Lingo. The Money is NOT in the List? Dean opened the class by telling us the money is not in the list! What? Even newbies like me know that building a customer list—a list of folks you can help grow their online business and then eventually sell products and services—is super important, so how could this be? While acknowledging that the “list’ is the most valuable asset, he states that it is much more important to build relationships and give value to your subscribers BEFORE you try to sell them. This relationship builds trust and then the money from product sales comes LATER. Internet entrepreneur and creator of “Starting with Marketing, The Newbie Internet Marketing Academy” which launched in July 2009, Dean Holland has updated his earlier e-Book on how to set up a profit pulling blog and released Dean Holland’s Blog 2.8 Setup Guide. Dean, a recent entrant to the world of making money online, specifically through affiliate marketing and opt-in list marketing strategies, offered his new blog setup guide to his Starting with Marketing students for them to use as a “giveaway” or free bonus for signing up for a mailing list. Internet entrepreneur and creator of “Starting with Marketing, The Newbie Internet Marketing Academy” which launched in July 2009, Dean Holland has updated his earlier e-Book on how to set up a profit pulling blog and released Dean Holland’s Blog 2.8 Setup Guide. 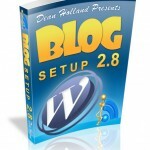 Dean Holland has been kind enough to offer me his Blog Setup Guide 2.8 as a free giveaway and thank you gift. I’ll post a full review later but grab your copy now if you can’t wait by clicking on the picture to the right and just enter your name and email address and I will email you your copy right away–even if it is 3 am! The book is packed with video tutorials on how to set up your own blog, which widgets to install, how to optimize your blog for search engines, and more. The book covers parts of what he has been teaching me in the Starting With Marketing Academy and has been recently updated to cover WordPress 2.8. Adam defined Web 2.0 as using social media (like twitter,Facebook) to introduce yourself; using your blog to educate readers, and then other websites to actually sell products and services. Great advice that a lot of those twitter spammers could follow—you know those people who auto-post some sales hyperlink every three hours! Dean Holland, creator of the Starting With Marketing Academy in his intro video that started my online marketing journey..Recommended watching for those interested in making money online or wanting more information about the Starting With Marketing Academy. Dean Holland’s Starting with Marketing class is in its third, action packed week and I finally made the time to watch the 8 part web video module called “Traffic Tanks”, today. This class actually covered a few things I am personally familiar with such as paid search or PPC and Google Analytics, which I have used both on The Computer Doctor website and for some of our customers. “Traffic” means visitors to your web page, so Dean’s class this week covered five basic, traffic building areas that he has used successfully, driving up to 700 visitors to his website in ONE day. Now of course major websites can get millions of site visits or “hits”, but for personalized niche sites I will be more than happy to have a couple of hundred daily visits! Sat in on a 30 minute webinar conducted by online marketing maven Dean Holland about 1 in the afternoon, 6pm UK time. Dean is from Great Britain and his personality is interlaced very well with the content of the class he is teaching. About 4 weeks ago I got word of the class through an email from Alex Jeffreys, another online marketing guru who had recently tutored Dean on his successful ways of making money online. So as Dean is one of Alex’s most successful students, there is some motiviational “juice” here for me, as I consider the possibilities of becoming a big success.